A showcase of local talent will be taking place in the wonderful setting of Birkenhead’s Williamson Art Gallery. 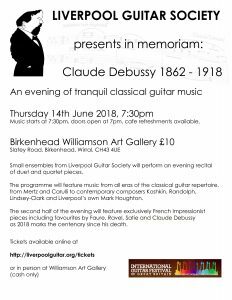 Small ensembles from the Liverpool Guitar Society will perform an evening recital of duet and quartet pieces. Music will include favourites from all eras of the classical guitar repertoire from Mertz and Carulli to contemporary composer like Nikita Koshkin, Laurie Randolph, Vincent Lindsey-Clark and Liverpool born and based composer Mark Houghton. Refreshments will be available in the gallery cafe before the performance and during the interval.